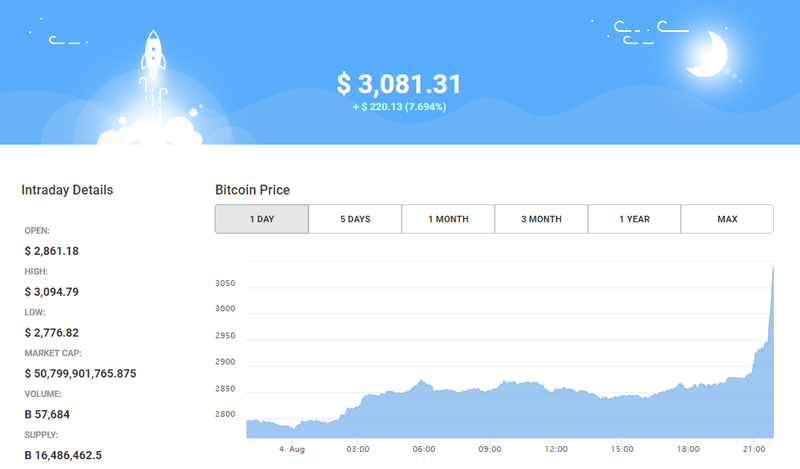 Bitcion price finally managed to cross $3000 mark to reach an all time high in the late hours (PST) on Friday. While BCash and other cryptocurrency prices keeps struggle for an upward trend, Bitcoin is headed for the moon. The assending triangle shows the price could go up to $3500 by morning itself. Could this be because of investors dumping their BCH for Bitcoin? Maybe. Regardless, BTC liquidity is back. Investors are more comfortable buying Bitcoin now. With SegWit only a week away, there is a good chance this bull run will continue for at least a month. Let the excitement continue..
BTC-e said it has regained control over its data centers and bitcoin wallets days after the site’s domain was seized by law enforcement agencies. This comes from an official account tied to BTC-e on Bitcointalk. It remains unclear who from the exchange is posting through the account. GDAX, the cryptocurrency exchange run by Coinbase, announced that it will launch support for Bitcoin Cash (BCC or BCH) sometime later this year. This means users who had Bitcoin in the exchange before the fork happened will get equivalent amount of BCH in their accounts. Marcus Hutchins, who was credited for stopping WannaCry attack has been arrested by the FBI. The 23 year old British security researcher could face up to decades in a US prison following accusations. He faces six counts of helping to create, spread and maintain the banking Trojan Kronos between 2014 and 2015.